The Barcelona-based Condor brand has been designing and manufacturing quality ctton tights for babies and children for over 120 years. The tights do not pill and have a permanent nice fitting. Available in a wide range of beautiful colors! Designed and made in Barcelona since 1898. Looks so cute with a pair of high knee socks! Also available in our webshop. Half long skirt with beautiful wooden buttons detailing. 100% organic cotton. Looks so cute with knee socks from Collegien! Also available in our webshop. 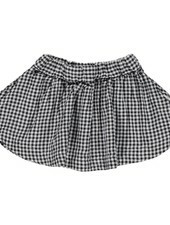 Light and airy gingham skirt. 100% organic cotton. A wardrobe favorite of ours! This dungaree dress has adjustable straplength and pockets in the side seam. 100% Linen. GOTS-certified olive wood button. Made in Lithuania. Also available in pink. A wardrobe favorite of ours! This dungaree dress has adjustable straplength. 100% Linen. GOTS-certified olive wood button. Made in Lithuania. Also available in blue. So much cuteness! These cotton bloomers are great to wear on diapers and look lovely with knee high socks by Collegien or rib tights during the colder days. So much cuteness! 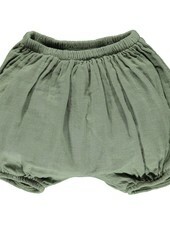 The musselin cotton bloomers are great to wear on diapers and look lovely with tights during the colder days.